There are days when physically I am just too tired to care. Lately, it isn’t just a matter of being physically tired, although I certainly am. What I am meaning is that I am beat down on every level, and all the while, apathy is creeping in as my spirit moves closer to total resignation. And at the end of the day, I’m too tired to care to fight any further. 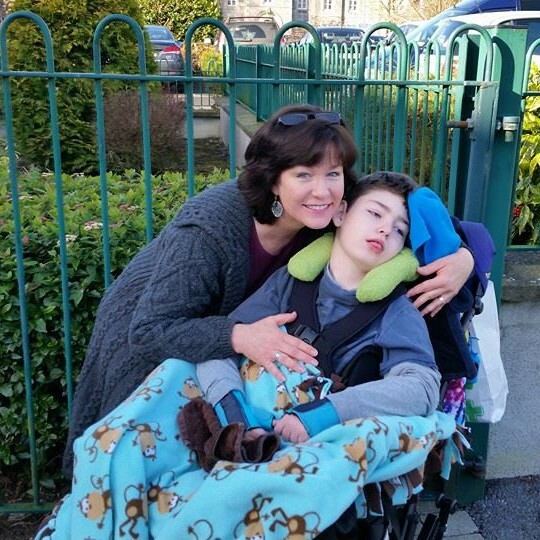 I was away for 4 nights while Brendan Bjorn was at LauraLynn Children’s Hospice. Let me rephrase that…we, as in my 9 year old son and I were away for 4 nights. The difference is definitely noteworthy. This mini-break was for him, for our relationship, for our bond. It was to give him that important one-on-one time with me that he doesn’t often get when I have to devote so much time, energy and attention on caring for his older brother. We went to the beach, horseback riding, and swimming. We drove from the east coast to the west coast and then back again. We argued, we laughed, and we cried at times as we talked of our life and the challenges we are facing. 4 nights away, and I am more tired than before we left. 4 nights away, and I cut the time short a day because I just couldn’t handle any longer. 4 nights away, and I’m aching for time to find my centre, to catch my breath, and to remember exactly who Tracy is inside. I’m never free to be me…just me. I am never on respite. I am always on duty. I don’t know anyone who understands fully exactly what we are going through. To be alone as a single parent with no family on this journey is hard enough, but when obstacles continue to be placed on the road in front of me, one after the other, it quickly becomes too much…and I am becoming too tired to care. As I spent a few days in the Westport, Co Mayo area, the beauty of my surroundings made me long for what I cannot have – a home…a home where I can actually find peace and recharge my spirit in the mountains and at the ocean. My artistic nature is grounded, settled, in such a place. And for a moment, I wondered if I could move so far away from the Dublin area, but alas, Brendan can’t manage that kind of travel with his health as it declines. So, I lost hope, again, that I could consider such a dream. And with that, I shoved another piece of Tracy deeper into the abyss of forgotten self in place of the invisible carer. The last house I viewed was as close to perfect as I’ve yet viewed, considering it wasn’t the nearly non-existent bungalow to rent, for all of Brendan’s special care needs. Yet the owners seemed to think it wasn’t and told the letting agent that no, we needed a bungalow, so they were not giving us the lease. It’s not the first time I’ve been told this excuse. As apathy sets in, I don’t care what I’ll hear anymore because I am giving up hope that there are any landlords who will have a heart and realise I simply can’t compete against the average prospective tenant. I’m angry, hurt, scared, and ready to give up. I just want a home to raise my sons in peace, safety, and security. I want to be able to stop fighting crowds of people at viewings for rental house after rental house that I inevitably don’t get. I want to stop fighting every step of the way for services, assistance, timely medical care…everything! I want to stop fighting so that I can spend the precious time Brendan Bjorn has left with us focused solely on him, Declan and our little family together, now, while we can. Is it not enough that we have to face a daily realisation that he is going to die some day? Is it not enough that we don’t know if that day will be tomorrow or next year? Can we not just be given that much in this tumultuous life of ours? Is that too much too ask for? Why I get out of bed. Why I fight.